One of the reasons for which SONEL was founded was to federate the tide gauge networks that exist in France, and ensure that emerging networks were properly incorporated. Although the project was initiated by B. Simon at the SHOM (1999) it subsequently ran into numerous practical difficulties. Finally, it was partially implemented at the University of La Rochelle in 2003 (first on-line observations) and involved just the RONIM and ROSAME networks (cf. actes AEI 2004). coordinating the publication in real time and in delayed mode of the data while ensuring that the conditions of accessibility and use comply with current legislation pertaining to information in the public domain. To this end, the SHOM set up REFMAR (opposite) where users can find the data (raw in real time, and quality checked in delayed mode) from tide gauges on French territory. 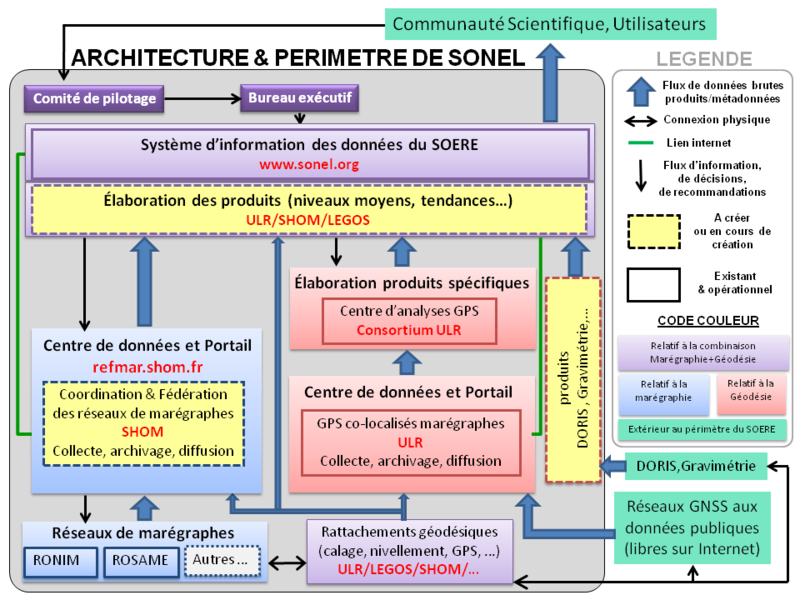 The fact that the SHOM has now taken on the tide gauge data aspect is excellent news and will enable the University of La Rochelle to concentrate its efforts on the other aspects of the SONEL system (see the architecture below). Moreover, it guarantees in particular that tide gauge data is managed by recognised specialists in the field, heirs to an experience which goes back to the first French tide gauge designed by the hydrographic engineer R. Chazallon in 1843. The infrastructure of SONEL has been reorganised accordingly, particularly the Web and FTP servers of SONEL, in order to bring it into line with the architecture described in the diagram opposite. It incorporates REFMAR in a manner which is optimal and as transparent as possible for users. Numerous links have been created at every level of SONEL, in particular to achieve the initial aim of a synergy of the tide gauge and geodesic data. There will be a transition phase which we will ensure to the best of our ability. 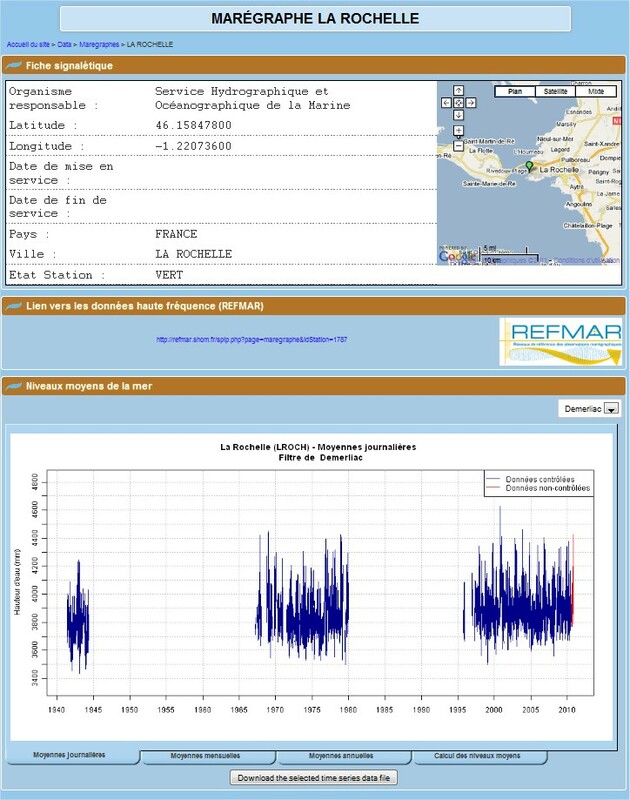 During this transition phase users will find French tide gauge data both on the ftp.sonel.org and www.sonel.org servers and on the refmar.shom.fr servers . However, they should be aware that they would be well-advised to look for the data at its SHOM (REFMAR) source . The SHOM has both a recognised expertise and centuries-long experience in the field of tide gauges. 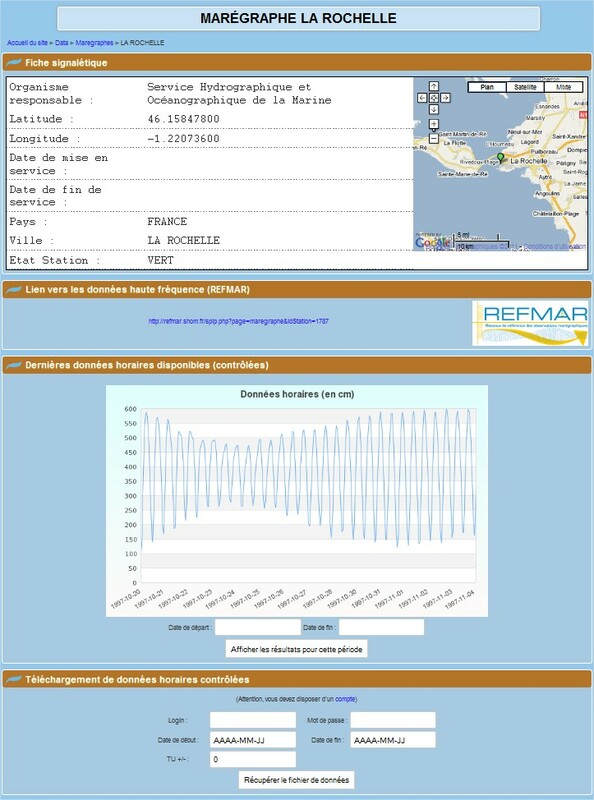 Moreover, any new development or change in the French tide gauge network will immediately be incorporated in REFMAR given the mission with which it has been entrusted (cf. instruction permanente), and whatever the French tide gauge network (RONIM, ROSAME, etc.). The source of high frequency data (REFMAR) will be identified and accessible from the SONEL Web pages of each station above the current visualisation and download sections during the transition phase (e.g., image on the left), although these visualisation and download sections will eventually disappear from the SONEL pages and only the link toward the source (REFMAR) will be available (e.g., image on the right). The images opposite provide an example of how this will look during the transition phase (which begins today) and going forward. As from today, users of high frequency tide gauge data (hourly, 10min.,...) are invited to register on REFMAR. Beginning of March, the high frequency tide gauge data will only be accessible on REFMAR, initially on the current provisional server, and eventually on the permanent server, which is under validation (beginning of April).